Whether you grow vegetables or flowers, it is natural to want extend the growing season as long as possible. As fall arrives, set aside a few minutes for "frost preparedness". If you can get your annual and perennial plants through the first couple frosts, you can add an extra week or two to your growing season. Set your supplies in a corner of your porch or garage where they are easy to access. Keep an eye on the forecast, and continue to keep your garden well-watered and free of weeds. Moist soil holds heat better and weed-free soil allows the heat to rise on chilly nights and warm your plants. Bury the heat. If you have an electric outlet outdoors, an alternative to covering your plants is to bury electric heating tape in the soil near their roots. This is the same type of tape commonly used for heating up garden beds in the spring. Electric heating tape is available wherever specialty garden supplies are sold. Make sure you follow the manufacturer's directions carefully to avoid creating a fire hazard. Bringing plants indoors. As for the plants you plan to overwinter indoors, it's time to start getting them used to their new environment. Free up some space indoors so you're ready when it's time to bring them inside. In the meantime, set the plants in a shady spot for a few days, and watch for insect problems. If necessary, treat them with an insecticidal soap before bringing them indoors. When frost is in the forecast, start covering your plants in the late afternoon when the soil is at its warmest. Give top priority to plants growing in frost-prone areas-such as exposed hilltops and low lying areas at the bottom of slopes. Cover individual plants with plastic milk jugs, soda bottles, or overturned boxes. To protect large plants or groups of plants, use old sheets or shower curtains. Prop the covers up with stakes and ties to prevent them from resting directly on the plant's leaves. If you have a large, narrow area to protect, like a row in your vegetable garden, consider using a floating row cover. Most are protective to about 28 F. Another method is to run your sprinkler system on a fine mist for an hour or two overnight (use a timer if necessary). The water will give off heat as it condenses to ice, keeping the internal temperature of the plants warmer than the air temperature. Don't worry about protecting vegetables like cabbage and kale, or root vegetables like carrots. They naturally produce extra sugars to protect against cold temperatures, and will only taste sweeter after a good frost. Check for damage: The morning after a frost, remove the covers from your plants and check for damage. If it's still dark but the sun is coming up soon, you can safely remove the covers even if the frost hasn't completely melted yet. 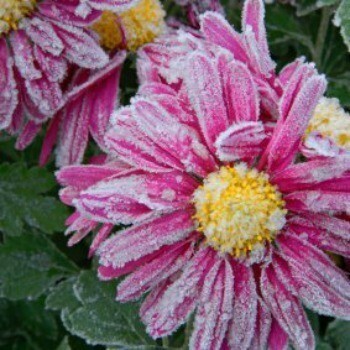 If you have a frost you were not prepared for, you may still save your plants. In the morning, before the sun hits those plants, spray them with some tepid water (neither too warm nor too cold) I use this method and have for years. I have a spray bottle on hand in the Fall and Spring just for this purpose. It's always worked for me. Jerry Baker (Master Gardener) wrote about this many years ago. It isn't the frost so much as the sun hitting the frost the next morning. Of course there is always the exception to the rule. But this is worth a try.